The third in my photo-series is this beautiful stained glass window by Douglas Strachan in the old nave of Dunfermline Abbey. It was commissioned in 1916 by the famous Dunfermline-born businessman Andrew Carnegie in memory of his parents, William Carnegie and Margaret Morrison. The colours are stunning, blending richness with subtlety. The window is set within the wonderful architecture of David I’s 12th century abbey church. You can read more about Dunfermline Abbey here on The Hazel Tree. Wonderful! Love that Norman architecture. Yes, a really stunning place! Yes! The colours are magnificent, and what a setting as well. Absolutely beautiful, thanks for sharing. And greetings to you, Jo, from Andrew Carnegie’s other home, Pittsburgh, PA! Douglas Strachan, I love his windows, I really must visit. 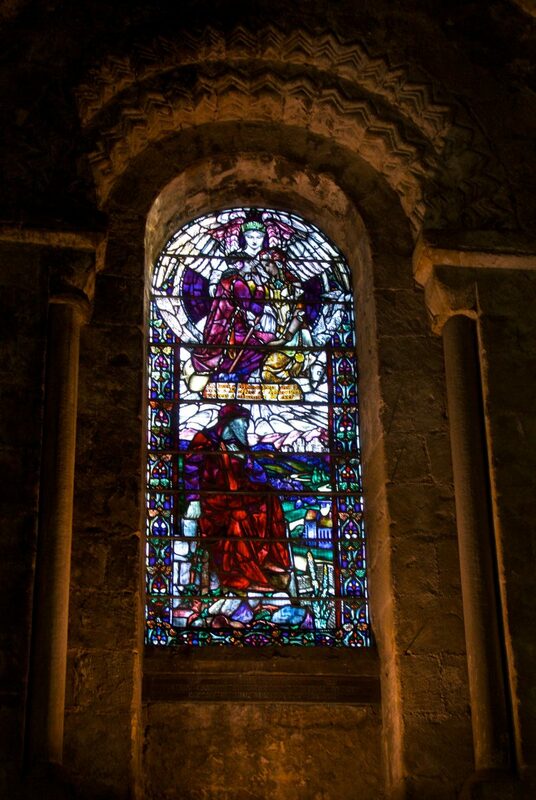 Beautiful photo Jo 🙂 We got up as far as Dornoch this last trip and visited the lovely little cathedral, it has some wonderful windows. Thanks, Lynne. Yes, you have found lots of Strachan’s windows yourself! His colours are amazing. Never been to Dornoch but it sounds lovely. Dornoch and all the coast along that part of Scotland is beautiful. We went to meet a blogging friend there, she said I would like and she was right. Yes! I am really only beginning to appreciate the beauty and artistry in stained glass windows. The colours in this are just so beautiful. We could use a new dose of righteousness this figure symbolizes! Yes – it struck me too, that the message is just as valid today! I know, well said, Jo! I shall have to look more closely at the other windows next time I visit. I was delighted to find the story behind this one. Dunfermline Abbey and Palace are magnificent. I’ve never seen anything quite like the interior of the nave, with those columns. Never actually been inside the abbey but walked around the graveyard and the arcitecture is really nice. Yes, what an amazing building! Well worth going inside if you have a chance! Yeah I really need to is it open all the time for the public to go into?